Gemstone Details: Round cut sapphires of exquisite color. Bangle Design: Charles Krypell 18k white,yellow and rose gold design with a textured finish and hidden "I Love You Today, Tomorrow and Forever" inscription. Please search #5995 for this piece in sterling silver. Measurements: Each bangle measures 5mm wide. 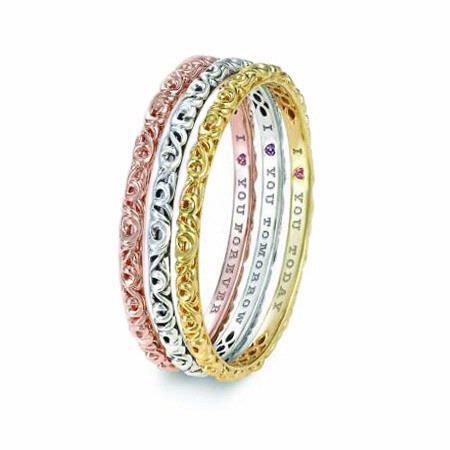 This beautiful Charles Krypell 18k white, yellow and rose gold bangle set from the Sterling Silver collection, features round cut sapphires of exquisite color, within the "I Love You Today Tomorrow and Forever" inscription. This bracelet also features a textured finish. A powerful message and unique design makes it an ideal valentine's day, mother's day or holiday gift. This bangle bracelet set measures 15mm wide. Please search #5995 for this piece in sterling silver. We are an authorized Charles Krypell dealer. Please call for pricing 1-800-790-6980 or 1-212-302-2863.